I reminded myself that once you start to defend someone, it's difficult to find a place to stop. But I went ahead and took that first step anyway. . .
For President Teddy Roosevelt, controlling the east-west passage between two oceans mattered so much that he orchestrated a revolution to control it. His command was to "let the dirt fly," and for years, the American Zone of the Panama Canal mesmerized the world, working in uneasy co-existence with the Panamanian aristocrats. 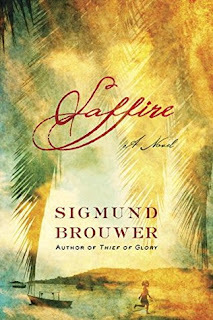 A love story set within a historical mystery, Saffire brings to vibrant life the most impressive--and embattled--engineering achievement of the twentieth-century. Sigmund Brouwer has been a favorite author of mine for years. He is one who can span many different eras and make history pop off the pages. Saffire, like many of the other books that Sigmund has written, unfold a more intense and deeper story as you dive further into the pages. Right off the bat, this story opens up with political dealings behind closed door. People want the higher ups involved, but due to the political restraints, they have to do some backdoor dealings of sorts. James Holt is a guy who is as far from the political intrigue as they come. He is honest and has high morals, but he is pulled into this by a very high placed friend. Everything starts off simple, a job that should only take a couple of weeks, but it grows as James helps a young girl, Saffire. Saffire, when introduced makes an impact and I couldn't help but route for this girl in hopes that she could find her mom. She was a spitfire who knew her mind, but still a child trying hard to live in a world of politics and mystery. There was so much to this book! It started off wondering about one thing, but it kept shifting and morphing. It made it hard to put this book down. SIGMUND BROUWER is the best-selling author of nearly thirty novels, with close to 4 million books in print. Based on his inspiration for Thief of Glory, which Sigmund wrote as a way to learn and honor his parent's stories, especially of his father's boyhood in a Japanese concentration camp, Sigmund leads The Chapters of Our Lives memoir seminars across the United States and Canada. (www.thechaptersofourlives.com). Sigmund is married to recording artist Cindy Morgan and has two daughters.